James Welch, in his superb book about the Battle of the Little Big Horn entitled Killing Custer, uses Chapter One to explain what happened in a massacre of innocent Pikuni including mostly women and children in 1870. Raised in the Blackfeet community in Browning Montana, James wrote a number of excellent books which drew upon his native American Heritage. His father was Pikuni, also referred to as Piegan, while his mother was Gros Ventre. The Pikuni are one branch of the Blackfeet, the others being the Blood and the Northern Blackfeet. Today the homelands of the Blood and the Northern Blackfeet are located in Canada, while the Pikuni are based in Montana. Sadly James died in 2003 aged 62. The illustration is a photo of a roadside marker kindly provided by Jon Axline. As I argue in my text, I think the part which states "The strike was in retaliation for the killing of Malcolm Clarke" is misleading. In my view it would be more accurate to insert "The US Army claimed " before this sentence. The Army, like the White population generally, tended to mask their violence behind unwarranted claims of retaliatory action. Since Clarke was married to a Piegan woman, Cut Off Head Woman the reason for his killing is much more consistent with it being as the result of a family quarrel. In other words Clarke was not killed because he was White but because of a disagreement at a family gathering. To argue that the attack on the Pikuni village was retaliatory is to accept the Army's spurious justification of it. The Army used his death as an excuse to employ their tactics of attacking villages in winter which they claimed had been successful. As I argue in my article about the Marias River Massacre their claim that this policy was successful was not true, such attacks were not only immoral terror tactics but they achieved little. It was an example of the "spin "they put on it in order not to lose face. I am currently researching the Washita attack 1868 which I see as also falling into this category, although subsequently terror tactics were "successful" in the Red River War 1874-5. Marias River Massacre or Baker Massacre?At first I went for the former, purely because James Welch did and that was good enough for me. I discovered that Paul Hutton called it the Piegan Massacre but this seems to highlight the people it was inflicted upon, so that seems to be unfair, I think they call it transference. 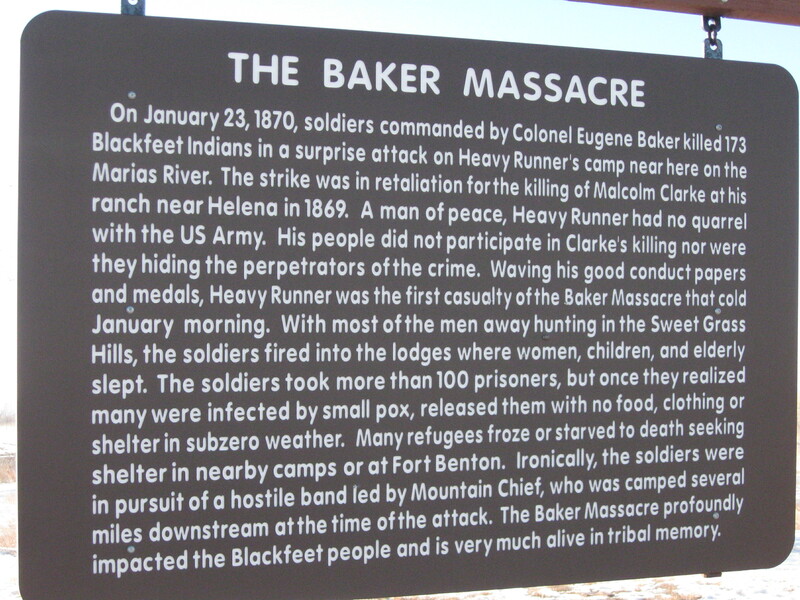 Coming across more and more "Baker" Massacres, like the roadside marker in the picture, for example, I was drawn towards this for a title. But then I reverted to my original choice when I considered that firstly, the use of Baker's name seems to attach blame to him personally when he was acting on behalf of the Army, despite what apologists might argue. And anyway, other events are usually named, at least in our culture, after where they took place: Wounded Knee, Sand Creek, and Washita River spring to mind. This led me to question the motives, not of those who unthinkingly call it the "Baker Massacre" but those who originally came up with idea, whoever they may have been. So "Massacre at the Bend of the Marias River" it is! "There is a white element in this country, (with a) rowdy and lawless character...and the traffic in whiskey with the Indians in this territory is carried on to an alarming extent. This frequently causes altercations between whites and Indians resulting often in bloodshed...Nothing can be done to insure peace and order till there is a military force here strong enough to clear out the roughs and whiskey sellers in the country. " "I despise the whites. They have taken our land. They have killed our buffalo, which will soon pass away. They have treated my nation like dogs. I shall no longer be responsible for my young men when they seek revenge." On 6 January 1870 Colonel Eugene Baker traveled from Fort Ellis to Fort Shaw with four companies of the 2nd Cavalry. Upon arrival the fort was sealed off, no-one was allowed to leave. This was precisely what had happened at Fort Lyon near Sand Creek six years earlier, when Colonel Chivington had led his troops into the notorious massacre of Black Kettle's Cheyenne. 13 days later Baker set off northwards towards the Marias River, having reinforced his troops with two companies of mounted infantry. They reached the Teton in sub zero temperatures, and thereafter moved under cover of darkness to try to remain undetected. The night march on the 20th took them to the mouth of the Muddy River, a tributary of the Teton, and the following night they made it to the dry fork on the Marias River where they hid all next day in a ravine. The nocturnal travel of the 22nd took them to the bend on the Marias, which they reached at 8am on the morning of 23 January. During the Civil War the Blackfeet were neglected by government administrators. For 18 months they had no agent at all, and consequently no annuities reached them during 1863. After failing to reach Fort Benton on the Missouri because its waters were too low, agent Henry Reed considered a journey overland from Fort Union to be too hazardous because the Lakota were on the warpath. He returned to his home in Epworth Iowa which was over a thousand miles from his post. When Gad E Upson was finally appointed in October 1863 he was so unsuitable that an old Indian trader, William T Hamilton commented: "he knew as much about an Indian as I did about the inhabitants of Jupiter. (6) In 1865 Upson was sent to negotiate a treaty with the Blackfeet and Gros Ventre. In return for annuities they were to cede the land south of the Teton River so that it could be opened up to white settlement. Not only did Little Dog, the head chief of the Piegans sign the treaty but during the winter 1865 he generously saved a number of snowbound gold prospectors in the Sun River Valley by hunting antelope and giving them the meat. Despite Low Dog's best efforts peace proved to be fragile owing to the racist aggression of a group of prospectors led by John Morgan, who killed four Piegan warriors and sparked off what the famous Jesuit Father De Smet referred to in June 1866 as " A fresh and furious war". Although this caused the Jesuits to withdraw from their mission in the Sun River Valley De Smet was quite clear that "again the whites have given the first provocation, "(7) The word which stands out here is "again". "When Marshal Wiliam F Wheeler went before the grand jury in October (1869) he listed fifty six whites who had been murdered and more than one thousand horses stolen by the Blackfeet in the year 1869." (18) Of course he did not enumerate Piegan deaths or elaborate the circumstances in which hostilities had occurred. On 9 October GG Symes, judge of the Third Judicial District of the Territory of Montana, on behalf of the US Grand Jury, issued a warrant for the arrest of five Piegan men, including Owl Child. Colonel W.S. Nye went on to reproduce the success for the "Campaign" which was claimed at the time by the army leaders. Nye singled out the surrender of Mow Way, as indicating significance, even though the effect of this Comanche chief's surrender was minimal. Having surrendered at Fort Bascom, Mow Way was transferred to Fort Leavenworth where he was sent under guard to Fort Sill. To the Fort Sill commander's surprise he arrived on his own, the guards having got drunk on the way, and he was soon released in June 1869. Such was the "significance" of what happened at Soldier Spring. Paul Hutton repeats the effect of Soldier Spring despite its insignificance and carries on the misrepresentation of what happened at the Washita as if it really was a battle and a victory as Sheridan and others claimed. It was much more comfortable politically for the Army to claim significance in carrying out a policy which proved little except the ruthlessness, and inhumanity of the Army leadership, not to mention their propensity to mislead. Unfortunately despite the evidence to the contrary many historians and others writing about these events are still referring to them as battles and victories, repeating what General Sheridan claimed erroneously at the time in order to enhance his reputation. Far from being battles or victories the only way these events could be perceived as successful was in the destruction of Indian homes, supplies and possessions, including hundreds of ponies at the Washita and several tons of dried buffalo meat at Soldier Spring. In other words the army's execution of its policy was successful in terrorising the "savages". Sheridan's bellicose official policy of attacking villages which would obviously contain women and children was endorsed on November 4th 1869 by Sherman, who was in overall command of the army. Sheridan was in command of the Division of Missouri. This vast stretch of land extended from Chicago in east to the Rockies in the west, and from the Canadian border in the north to the Rio Grande in the south. Sully's reputation as an Indian fighter was founded on his perceived success against the Seminole in the 1840s and against the Santee in Minnesota in the early 1860s. However Sheridan had no time for Sully since Sully had served under him in the 1868 campaign, and had had differences with Custer with whom Sheridan replaced Sully. General de Trobriand, ordered Baker specifically to leave Heavy Runner's band alone, but despite mixed race scout Joe Kipps's (Raven Quiver to his Pikuni relatives) desperate warning to Baker that he was attacking the wrong village Baker chose to ignore the order and attack anyway. Baker claimed that of 173 dead 53 were women and children. The nature of the engagement was such that the army lost only one soldier, with another suffering a broken leg when he fell off his horse. Similar to Washita and Soldier Spring Indian homes and possessions were burned. Once the murderous attack had taken place Trobriand and Sheridan rallied to praise it as a great victory. Paul Hutton observed that this response by Sheridan, although loyal to Baker, was ill judged since it served to undermine the political position of the army. Hutton goes on to point out that at this time Sheridan's officers were in total control of both Indian and military affairs in Montana, yet there was still no centralised management or planning. "Military authorities proved as incapable of working together as would military and civilian officials when authority over the Indians was taken away from the army." (43) Writing today it is difficult to comprehend the lack of communication within the army even without the personality clash between leaders like Sully and Trobriand and the individual responsibility left to commanders in the field like Baker. That this lack of communication was typical of the military at this time is basic in understanding why commanders seemed to make decisions in isolation. They seemed to because they did. Contrary to "common" sense, lack of communication bedevilled the army's pursuit of the Nez Perce, for example, and even more famously prevented concerted action by Custer and Crook and others in the Little Big Horn campaign. Even the author of a recently published work on the Custer Fight did not understand this to the detriment of his "analysis". While Paul Hutton's article does not make this mistake, astonishingly he does seem to seek to diminish the blame on the military for attacking a benign, defenseless village with an explanation based on the interests of two scouts who were guiding Baker. Hutton seems to try to lighten the blame on the commander by suggesting that Cobell opened the firing, in an attempt to stop an attack on Mountain Chief's village because Cobell was married to Mountain Chief's sister. Yet Hutton does not produce evidence that Baker made any attempt to halt it. That is simply because Baker was committed to attack, despite Joe Kipp's warning that the village was that of Heavy Runner. Hutton points out irrelevantly that Joe Kipps's Pikuni wife was in Heavy Runner's village. Hutton's idea is a red herring anyway, for Baker was actually in charge, so he was responsible, regardless of what his scouts told him, did or what their motives were in trying to protect their own families. More seriously, Hutton wants to reduce the culpability of Sheridan, using emotional language like "loyal to a fault", suggesting that Sheridan was showing support for Baker when in all likelihood Sheridan was only supporting Baker out of self interest since he perceived a need for the army to present a united front. Having himself presented the events at the Washita and Soldier Spring as successful Hutton misses the obvious point that once the attack was made by Baker it also had to be seen as a success, as part of a successful policy. Sheridan was merely misrepresenting what had happened to make sure that his previously unsuccessful policy of attacking civilian targets was perceived as being once again successful. He was merely repeating what he had already done, not out of any loyalty to Baker but to try to ensure that his policy was not discredited. Paul Hutton goes on to compound the mistake by even using the same language as those like Sheridan in the nineteenth century when he refers to the Indians as follows: It was, says Hutton, "exceedingly difficult to punish hostile Indians while protecting friendly Indians". If Hutton was writing dispassionately the notion of protection should not arise. The idea that bands like Heavy Runner's needed "protection" is preposterous: "protection" from what or whom? This is the kind of emotive language used by those such as Sheridan to justify attacking innocent and defenseless bands of Indians, including civilians. As for the notion of attacking "hostile" Indians Hutton is a knowledgeable enough historian not to have fallen into the trap of accepting the notion of those such as Sheridan who wanted to be able to attack defenseless villages when they were laid up for winter. They also sought to justify it by arguing in effect that all Indians were responsible for the actions of a few, hardly the basis of the US penal code. Or, as in some cases like those in the Red River War and those leading up to the Battle of the Little Big Horn, they argued against all reason that any Indian not on the reservation was by definition "hostile". The cover up is also worsened by the fact that any attack of Mountain Chief's camp would not have been preceded by an attempt to identify the "culprits" who had killed Malcolm Clarke, which ostensibly was the reason that such an attack would have been made. As Ewers clearly states, Mountain Chief's band "was believed to be harbouring the culprits" (33) This, in itself, did not justify an indiscriminate attack, despite what the army said at the time and too many historians and commentators have trotted out ever since. When this message was relayed by Trobriand to Baker his message was equally clear about making sure that Heavy Runner's band were not attacked. Unfortunately owing to incompetence, drunkenness, bad luck or a bit of them all, the "wrong" village was attacked, but if the "right" village had been subjected to same kind of assault then the same carnage would almost certainly have resulted, or at the very least would have been seen as acceptable by the Army, something which many historians and commentators through time have ignored. 26 The Army's Policy and its presentation were similar at the Washita in 1868.